Music in a Lifetime is designed for multiple entry points to learning. Students may explore the website independently to learn more about music, music-making, and a lifetime of music. Teachers may choose to guide student inquiry more directly, within the context of the curriculum. Each page frames thinking with three initial questions that focus on the big ideas. Further questions and resources help students delve more deeply, following their own particular interests. 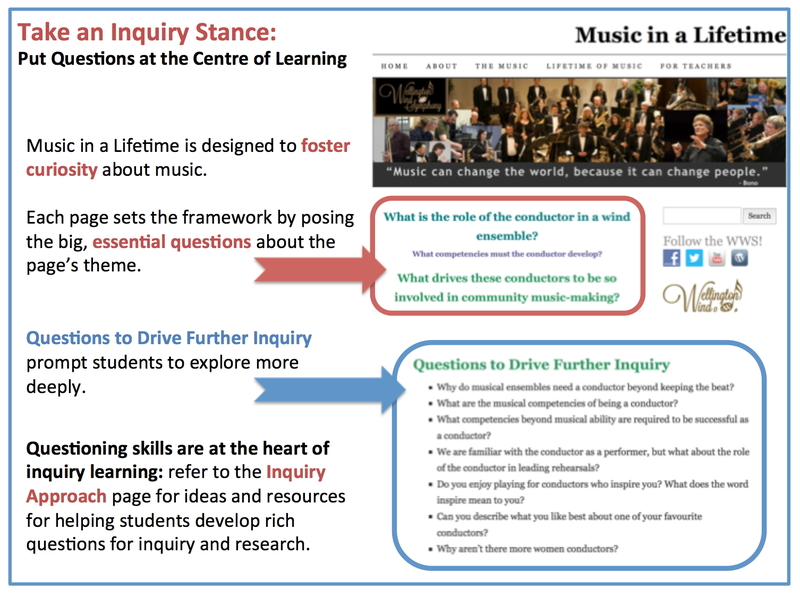 Independent Exploration: Guiding essential questions in this resource invite students to explore their own reactions to the musical works and performances. Ideas from the embedded videos and the additional resource links invite students to follow their own lines of inquiry as they explore the music, and music in their lives. Guided Inquiry: These lesson ideas suggest relevant and engaging instructional approaches. The approach is not prescriptive: Music in a Lifetime works best when the teacher embraces a true inquiry stance to learning. Music in a Lifetime offers two main areas for exploration, The Music and Lifetime of Music. Canadian Music: The focus is on works by Canadian composers, a particular area of focus for the Wellington Winds Symphony’s Appassionato Project. Other Music: Original works and transcriptions for wind ensemble by international composers. Includes works with soloists (instrumental and vocal). Musicians: Watch sectional rehearsals and listen as the musicians discuss their instruments. Questions and resources foster further exploration about instruments and great performers. Commitment: The focus is on what it takes to become a performing musician and how to keep music in one’s life. Questions and resources make links to careers and developing musical skills. Rewards: The rewards of music-making are both tangible and intangible. Questions and resources foster inquiry about the collateral benefits of being an active musician. Community: One of the great involvements of a lifetime of music is making strong connections in the musical and the broader community. Questions and resources focus on the benefits of community music-making. Have students compare original orchestral versions to the transcriptions performed by the Winds. Use video performances in this resource to for purposeful listening and score study. Have students use the resources presented in this website to initiate research related to specific music, composers or instruments, and describe the impact of that research on their own perceptions. Make connections between student research and developing skills in critical listening and personal interpretation of music. Using the performance of orchestral transcriptions as examples, have students transcribe a simple piece for a small ensemble of wind instruments. Have students explore and analyze how composers have manipulated the elements of music to express ideas using selected videos represented in this resource. Have students explore and analyze how musical interpretation has been applied by the conductors and musicians using selected videos represented in this resource. Have students explore the significant contributions made to society by the composers, arrangers and musicians represented in this website resource. Use the Lifetime of Music section of this website to have students identify and describe the interpersonal skills and work habits and character traits demonstrated by the musicians of the Wellington Wind Symphony. Make connections to developing similar skills in the music classroom. Use the Lifetime of Music section to explore the benefits of music making in the community, and make connections to co-curricular music activities at school. Explore the potential of partnerships with musical groups in the community, like the Wellington Wind Symphony, in providing listening opportunities, mentorship and a model for continuing participation in music-making beyond the school. Guidance and Career Education: Make connections to how music-making helps to develop learning and social skills for success in music and in life. Explore the many career options for which music education sets a strong foundation. Business Studies: Explore the role of good leadership and management in administering musical groups, as well as the role of marketing, information and communications technologies and entrepreneurship in helping musical groups succeed. Canada and World Studies: Explore community music as an element of identity, and connectedness to local, national and international communities. Explore the role of music in developing national identity. Social Sciences and Humanities: Explore how being involved in music plays a role in personal well-being, developing self-concept and building self-esteem. Explore aspects of community involvement made possible through involvement in music. Explore the impact of music on cognitive, social and emotional development. Interdisciplinary Studies: The open-ended critical-thinking approach taken in Music in a Lifetime provides a great starting point for students exploring the relationship between music and other disciplines, such as those suggested above. Interdisciplinary studies courses focus on developing skills for inquiry and research, which aligns well with the approach taken in this learning resource. Collaborative Planning and Teaching: Your teacher-librarian can collaborate with you in planning, delivering and assessing learning units and tasks that leverage the inquiry approach taken in this resource. Research Process and Information Literacy: Inquiry learning means developing more sophistication in accessing resources, processing ideas and sharing learning. The ability to assess the quality of information sources and use them appropriately are also key to learning. Your teacher-librarian can help your students make good decisions about information as they explore independently or within a more focused unit of study. Depth of Resources: Music in a Lifetime is rich in resource links for using information sources freely available on the worldwide web. Your school and public library provide access to online resources for deeper research, and print collections may also be useful in delving into many topics. Music in a Lifetime relies heavily on internet technologies to present resources and frame learning. Similarly, technology may provide meaningful ways for students to make sense of ideas and share their learning in and beyond the classroom. The SAMR model provides a useful framework for thinking about technology integration, and its use is supported by the Ontario Ministry of Education. Visit OSAPAC’s SAMR Project to learn more.